Welcome! My name is Ashley George and I'm very excited to begin a new year here at Hill Country Middle School and all the fun and success that we will have together! 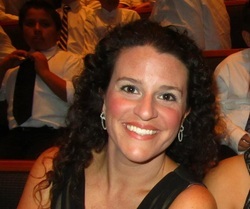 I love teaching middle school choir and I so look forward to getting to know all the wonderful students and parents. This is my 16th year of teaching, and my 6th year at HCMS, and it's off to an amazing start. I taught 10 years with AISD at schools such as Oak Hill Elementary, Burnet Middle School, and Bedichek Middle School. I'm originally from Dover, Delaware, but have lived in Austin for 15 years, so I now call it home. I received my undergraduate degree in Music Education from West Virginia University and my Masters Degree in Choral Conducting from Texas State University. In my spare time, I enjoy all the wonderful outdoor activities Austin has to offer, spending time with great friends, cooking, playing the piano, and hiking with my dog Lucy. I am thrilled to be teaching here in Eanes with Katy Bratton and I look forward to a great year!